Since Paris is the only big city in France, one has to speak separately of safety in Paris, which compares to other large cities such as New York or London. A tourist in Paris should always avoid riding the subway or walking alone at night. In general, the Paris subway is considered unsafe, and the bus system is the recommended means of transportation. When driving in Paris, one should always keep the car doors locked and never leave valuables, or anything, visible in a parked car. 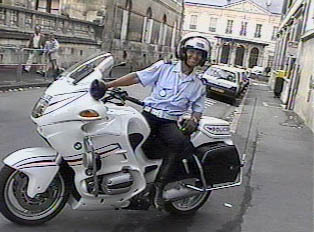 The police in Paris are very efficient; the national number for the police is 14. Safety is not such a big concern in smaller cities and towns, but one should always use common sense about such issues as securing ones belongings and traveling alone at night. Ask local residents about particular neighborhoods and routes. Most doctors are private and have offices in buildings throughout the cities. Doctors also make house calls. There are both private and public hospitals in France, with the latter having a reputation for being less efficient. In addition, there are American private hospitals, which have a very good reputation. The number for the ambulance is 15, and the number for phone directory information is 12. Dialing 112 will reach the police even if calling from a point where there is no cell phone signal (in a tunnel or on a subway).